Actually, this turtle/tortoise came to our front door. We normally only see aquatic turtles (i.e., especially RES, yellows, etc.) in NE Florida. I placed it in the backyard and it has established residency in the ferns under the llive oak tree. It comes out every morning to feed on the cut apples and strawberries. This morning it was eating a slug. Does anyone know what type it is? Looks like a 3 toed box turtle, though it's been established that I am poor at IDs. Thanks! I have two well domesticated (and spoiled) RES (male and female). There have been wild snapping turtles and other RES walking through our neighborhood. I've even had a wild female RES come into our yard. I placed her in the backyard until I could return her to a nearby pond. Well, when I went in the backyard, she was in the process of digging a nest and laying her eggs. 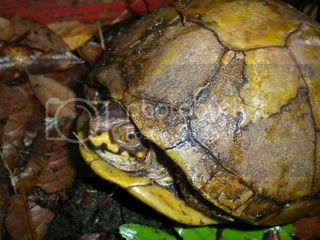 steve wrote: Looks like a 3 toed box turtle, though it's been established that I am poor at IDs. Kinda looks like a 3 toed to me too. bigG, could you maybe get a pic of his whole body? It is a very old Three Toed Box Turtle. Looks to be a male. Turtles walk around in the neighborhood? That's awesome.